Teaching – Patrick F. Clarkin, Ph.D.
One of the better examples I’ve yet found that conveys the concept of evolution comes from the 2002 NOVA documentary “Search for the First Human.” The main focus of the video is the species Orrorin tugenensis and it’s possible place in our family tree six million years ago. However, two particular segments stand out to me, and I think do a pretty good job of conveying the idea of evolution to students. This is the fourth year I’ve visited the 8th graders at the KIPP school in Lynn, Massachusetts to talk about anthropology and evolution for a few hours. 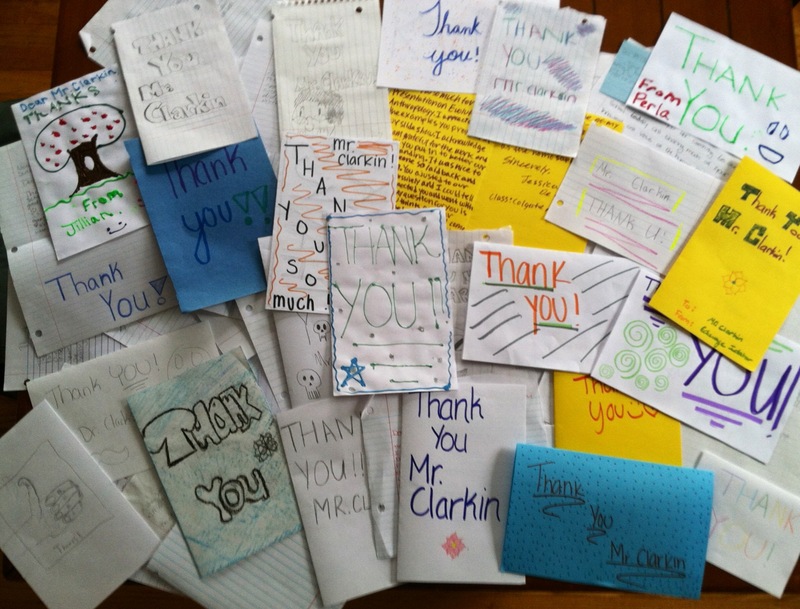 Every year, their teacher has them write me thank you notes, about 90 in all over three classes. That alone makes the visit worth it.